The Indiana State Library will be opening a Young Readers Center in 2016! The idea was inspired by the Young Readers Center at the Library of Congress in Washington, D.C. The Indiana Young Readers Center will be a place for kids to learn about the talented authors and illustrators from Indiana and about our great state itself. The first step in creating this space was building a collection. 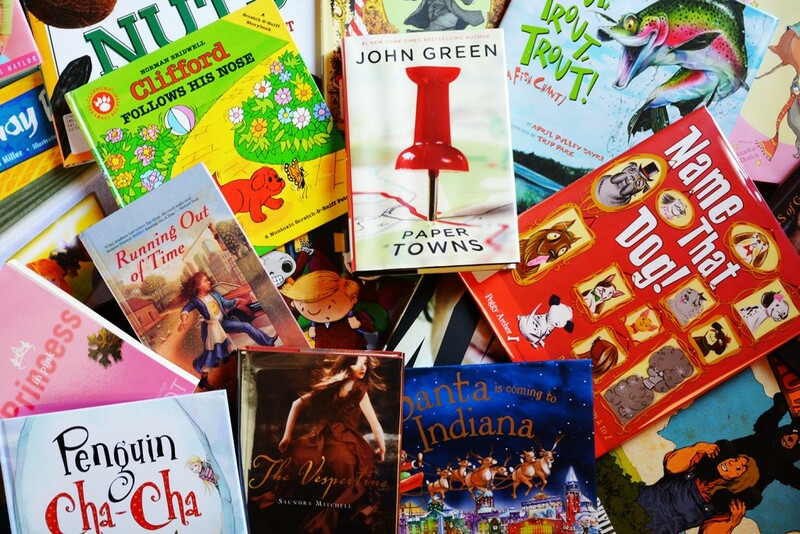 The Indiana Young Readers Center collection includes materials written or illustrated by Indiana authors and books about Indiana for kids and teens. A portion of this collection is already circulating and available to check out. The Center also houses special, non-circulating collections of autographed books by Indiana authors and illustrators and Indiana state book award winners for children and teens. The Indiana Young Readers Collection includes books by Hoosier authors Jim Davis, John Green, Meg Cabot, Norman Bridwell, and many more! The Indiana Young Readers Center is located in the original 1934 portion of the Indiana State Library. The room features beautiful walnut woodwork and shelving. Carpet was installed in the Center in November and has already given the room a fresh look. New furniture will be added soon. The historical architecture of the room will be preserved, but the space will be updated to appeal to youth. The goal of the Center is to mesh the old with the new to provide children with a fun space to learn about Indiana and promote literacy. 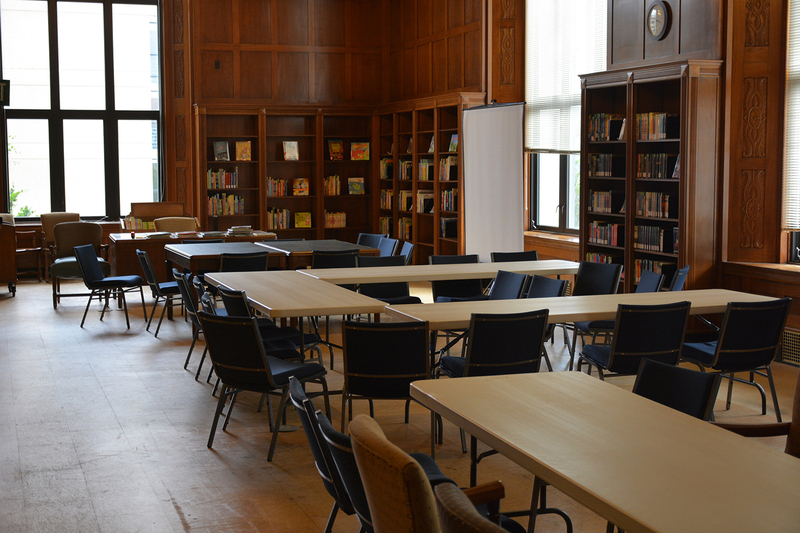 Before: The location for the Indiana Young Readers Center is the old Manuscripts Reading Room. This picture shows the room set up for an event at the State Library earlier in the year. Notice the room did not have carpet, but corkboard covering the original flooring. 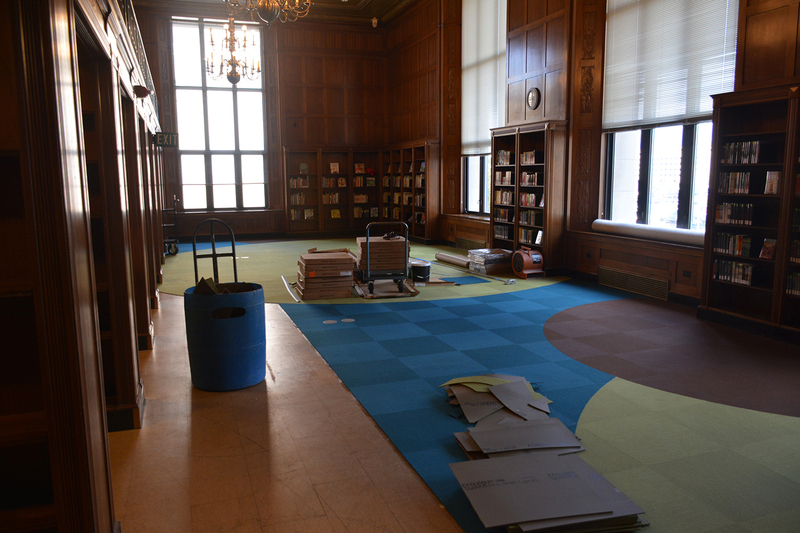 Progress: The new carpet being installed in the new Indiana Young Readers Center. The carpet brightens the room, but coordinates nicely with the natural colors of the woodwork original to the building. The Center will have interactive exhibits for kids to learn more about featured Indiana authors, Indiana facts, family history, and how to become a writer or illustrator. There will be designated spaces for story times and other activities for visiting children to enjoy. The space may also be used for larger special events hosted by the Library, such as writing workshops, Letters About Literature, and Statehood Day. A few thousand Indiana 4th graders visit the State Library each year on field trips and the Young Readers Center will be a focal point of their tour. The students, and other visiting children, will finally have a place in the library just for them. We’ll keep you updated on this exciting new addition to the Indiana State Library! 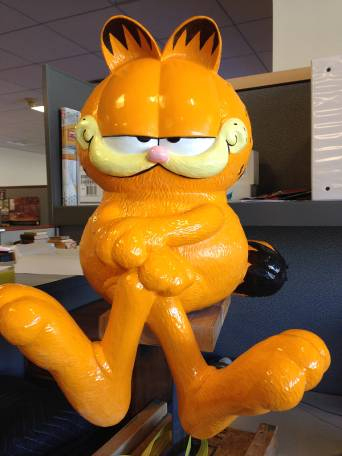 A statue of Garfield, the famous cat created by Indiana cartoonist Jim Davis, will sit on a bench at the entrance to the Indiana Young Readers Center to greet visitors and provide the perfect photo opportunity when visiting the State Library! This blog post was written by Indiana Young Readers Center Librarian Christy Franzman. For more information on this post or the Indiana State Library, please call at 317-232-3675 or Ask-a-librarian. This entry was posted in Indiana Division and tagged Books, Children's Books, Indiana, Indiana Authors, Indiana State Library, Library, Library of Congress, Young Adults, Young Readers by indianastatelibrary. Bookmark the permalink.